Place salmon on a foil-lined baking sheet coated with cooking spray. Rub evenly with oil, salt, and pepper. Bake at 425°F for 10 minutes or until fish flakes easily when tested with a fork. 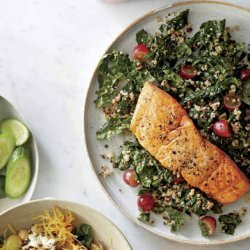 While fish cooks, combine kale, quinoa, All-Purpose Citrus Dressing, and grapes in a bowl; toss to combine. Let stand 5 minutes. Top with salmon.